The problem with a Burns Supper is that while traditional, it’s hard to get too excited about eating Haggis. When your friends include a vegetarian and two meat-eaters but with vegetarian/vegan tendencies (don’t ask 😉 ), it seems unlikely that haggis will go down well. So instead I went for a Modern Scots themed menu. This dessert is my take on the traditional Cranachan, which lends itself perfectly to ice cream form. Cranachan is whipped cream, flavoured with whisky, sweetened with honey and topped with raspberries and oats. To create Cranachan Ice Cream I started with a basic raspberry ripple recipe replacing the sugar in the ripple with honey, the vodka with whisky and adding an oat praline layer. Due to the number of steps and the freezing time this recipe will take a minimum of 3 hours. When making this Cranachan ice cream I used The Perfect Scoop by David Lebovitz using his Raspberry Swirl ice cream as the basis for my recipe and I would suggest if you are wanting to get into ice cream making you should buy this book! I started off by making a Oatmeal Praline, I had never really made caramel before I started cooking with David’s book, but it turns out that melting sugar is actually pretty easy to do. ~ enough for one batch of cranachan. Recipe from David Lebovitz‘s The Perfect Scoop. 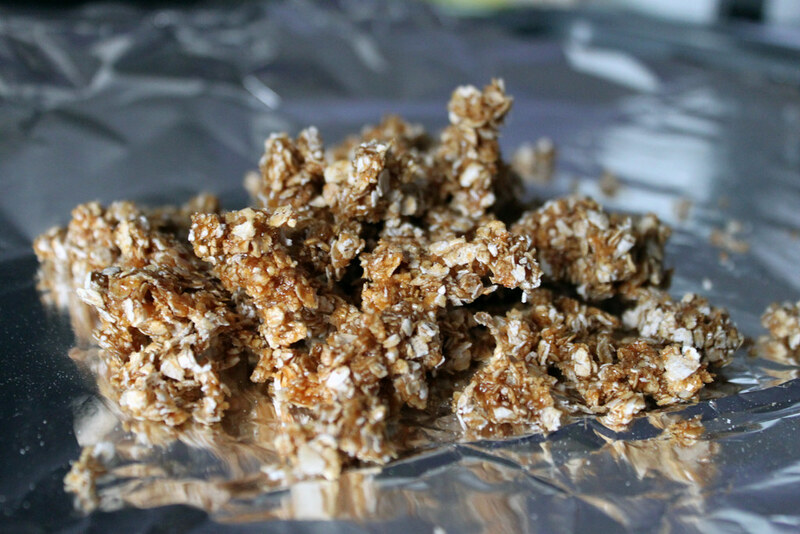 Toast the oats on a foil lined baking tray in a 175oC oven for 10 minutes, till they are starting to brown. You will need to make a dry caramel (where you melt the sugar in a pan with no water), if you never made caramel before you should read these instructions on how to make caramel. Once the caramel is done take it off the heat and immediately stir in the toasted oats. Quickly spread it back on to the baking sheet on top of the foil to allow to cool. Once cool break the oats into small pieces, and whizz in a food processor into very small pieces, almost dust otherwise it is very hard to eat. Keep the oat praline in a sealed container in the freezer until ready to use. The next step is to make the ice cream base, as it will need sometime in the fridge before you can run it through the ice cream maker. Follow the directions on David’s website for Vanilla Ice Cream (although note that the quantities outlined here are slightly different, because you need less ice cream when you are adding the swirl, and you don’t need to use a vanilla bean for the extra flavouring). While you are cooling the ice cream mixture (before you start to churn it in your mixer) you should make the raspberry swirl (details outlined below). The Raspberry swirl is really what elevates this ice cream from a standard raspberry ripple to Cranachan, this is also where I deviated most from David’s recipe. ~ enough for one batch of cranachan. Basic recipe from David Lebovitz‘s The Perfect Scoop. If raspberries are frozen, leave to defrost for an hour. Roughly mash up the raspberries with a fork, leaving some larger pieces. Mix the honey and whisky. Set aside in the fridge. While it may look like a lot of effort each section is easy and you can do a lot of them at the same time, e.g. you can make the swirl as you are cooking your custard, and have your oats toasting in the oven all at once. Immediately before your ice cream has finished churning in the ice cream maker, get ready your freezable container, your raspberry swirl and your oat praline. Once the ice cream is finished churning pour half into your container, then pour the raspberry swirl on top, followed by a layer of oat praline. Top with more ice cream. Pop in your freezer for at least two hours before serving. This ice cream was so smooth and creamy, despite the fact I only use semi-skimmed milk and single cream! In fact for me it was just about perfect level of richness. The raspberry swirl just had a hint of whisky but was so tame the uninitiated couldn’t even tell it was there! Normally I would suggest adding more whisky if you think those eating it could handle it – however messing with the alcohol content of ice cream is usually an easy way to disaster. 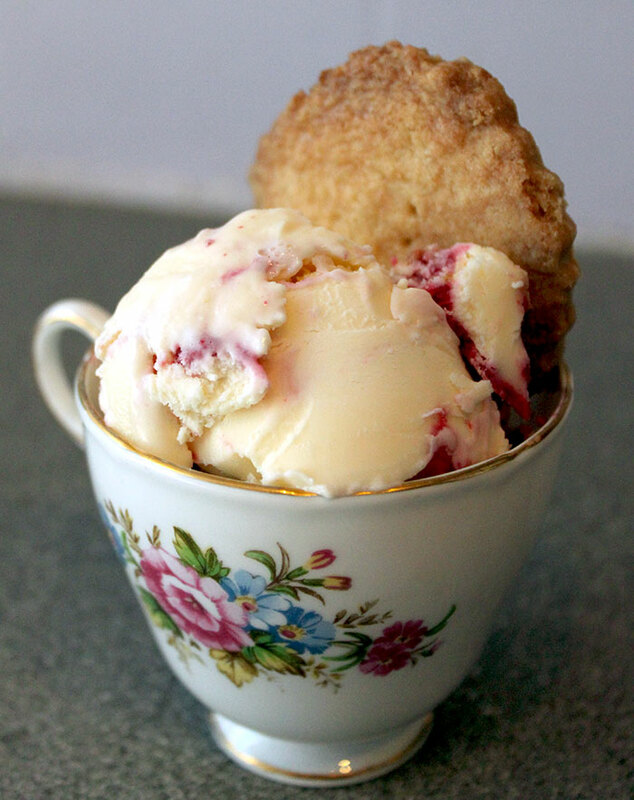 Instead I will suggest that when serving top with extra rasperry swirl with more whisky added. The perfect accompaniment to this dessert is a shortbread biscuit, I used this recipe from the BBC Food website.